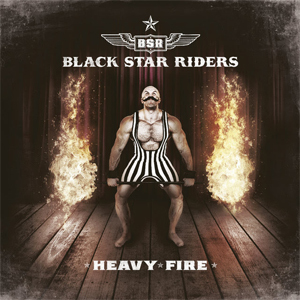 BLACK STAR RIDERS Stream New Album Title Track "Heavy Fire"
U.S./Irish hard rockers BLACK STAR RIDERS are set to release their third album Heavy Fire on February 3rd via Nuclear Blast Entertainment. Today, the band premiere the new lyric video for “Heavy Fire”, the album’s thundering opening track. Lead vocalist/guitarist Ricky Warwick explains about the track, "Only fools would believe that rock n roll can rejuvenate a world in the throes of a collapsing civilization that's coming under heavy fire from all asunder. But what if the would-be fools are right?" From the immediate riffs of album opener "Heavy Fire" to the instant hooks of first single “When The Night Comes In”, from the dirty bass groove of to the familiar and trademark dual guitars of Gorham and Johnson on “Testify Or Say Goodbye”, Heavy Fire is an album that will further cement BSR's reputation as one of the world's premiere rock acts. Following on from their albums All Hell Breaks Loose and The Killer Instinct which have paved the way for BLACK STAR RIDERS to be recognised as a power force in the modern day of Rock n’ Roll, Heavy Fire will be once again released by Nuclear Blast Entertainment. The band have also brought in PledgeMusic, one of the most innovative and successful platforms of the modern music world, to give fans extra special product and experiences to go along with the album’s release. "Dancing With The Wrong Girl"
"Thinking About You Could Get Me Killed"
After a full year off the road, BLACK STAR RIDERS (Ricky Warwick, Scott Gorham, Damon Johnson, Robert Crane and Jimmy DeGrasso) are back with a 16 date UK & Ireland run, joined on the first five dates by Scottish rockers GUN and THE AMORETTES and then Sweden's own BACKYARD BABIES with GUN on the remaining 11 shows.